Can new franchise owners purchase branded merchandise with the 911 Restoration name and logo? Because 911 Restoration is trademarked, all 911 Restoration branded uniforms, marketing material, merchandising, etc. is available for low-cost purchase through our private e-Store. Does 911 Restoration generate water damage leads for their franchisees? Yes, 911 Restoration does generate our own restoration work and water damage leads for our franchisees. Does 911 Restoration have any national partners or preferred vendors for franchise owners to purchase or rent restoration equipment? 911 Restoration has multiple national purchasing agreements from equipment and vehicles to consumables and rentals. We can help you with all your needs. Does 911 Restoration offer any franchise discounts for new franchise owners? Yes, 911 Restoration offers a 15% discount to veterans off of the initial franchise fee. Does 911 Restoration offer any franchise discounts to veterans or military members? Yes, 911 Restoration offers a 15% discount off of the initial franchise fee to veterans and military members. Does 911 Restoration offer training for new disaster restoration franchise owners? After a week of intensive training, ranging from marketing and business development to water restoration and mold detection, at our Los Angeles Headquarters, you will be assigned to an established branch for field training. We will tailor your training to your experience level. How did 911 Restoration start and what is its franchise story? The 911 Restoration story began as a shared dream between two longtime friends working at a carpet cleaning company who wanted to make a difference in people’s lives. Read more about our franchise story here. How does 911 Restoration retain customers and is customer retention software used? Our 24-hour dispatch center is the first point of contact with your customers. Once your customer’s information is entered in our Customer Retention Software, the work order is electronically dispatched to you and your staff. How large and profitable is the disaster restoration franchise industry? The restoration franchise industry is considered recession-proof at an annual value of $210 billion, making it a great business investment and franchise opportunity. How large in size and population is a restoration franchise territory? If a new franchise owner purchases a traditional franchise territory, the population will range from approximately 250,000 to 350,000 people. If purchasing a micro-market, the population will range from approximately 100,000 to 249,999 people. How long has 911 Restoration been in business and when was it founded? 911 Restoration was founded in 2007, as this is the year our co-founders decided to franchise the company. How many franchise locations does 911 Restoration currently have? Our 911 Restoration franchise currently has over 350+ territories. How much are the monthly franchise royalty fees at 911 Restoration? The monthly franchise royalty fee at 911 Restoration for a traditional franchise or micro-market franchise is 10% of your gross revenue for “restoration services”, and 3% of gross revenue for “non-restoration services.” Based on 2018 FDD and subject to change. How much money is needed to invest in a new restoration franchise location with 911 Restoration? Please refer see our “Investment” page for start-up cost. Is previous restoration or water damage experience needed to own a restoration franchise? 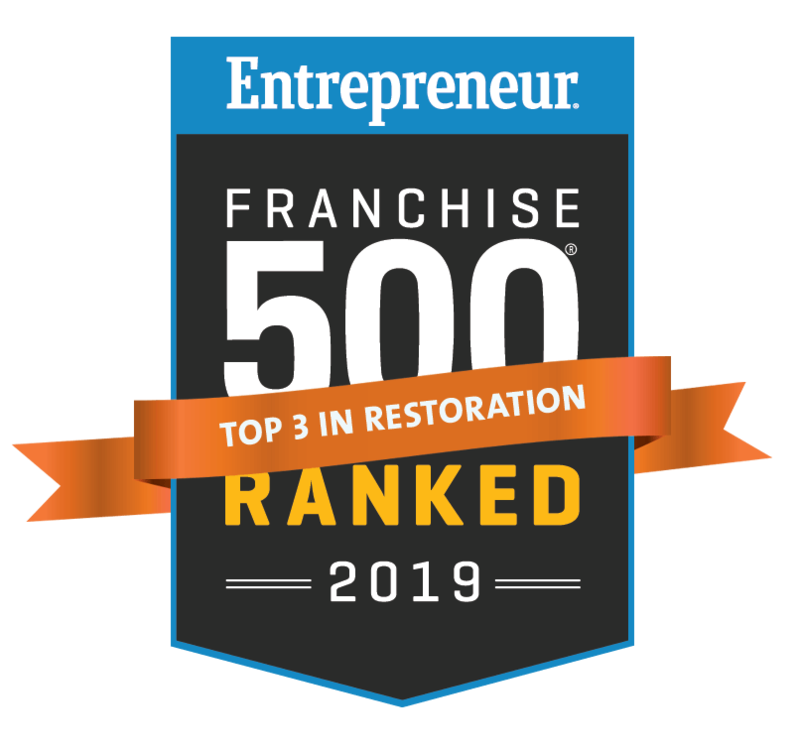 No, previous restoration or water damage experience is not necessary to own a restoration franchise as many of our top performing franchise owners come from various industries and backgrounds. However, strong sales experience and business savvy is encouraged. One of my biggest challenges is working with insurance adjusters. Does 911 Restoration offer their franchisees estimate or pricing support? 911 Restoration offers assistance with Xactimate estimating services. Xactimate, often called the language of the insurance industry, dictates a restoration company’s pricing. Additionally, our process department can support you in negotiating with insurance adjusters. What finance options are available at 911 Restoration for new restoration franchise owners? 911 Restoration is eager to partner with dynamic franchise members. In cases where a potential franchisee shows great potential but lacks financial means, 911 Restoration may offer in-house financing. Furthermore, 911 Restoration has had great success in working with potential franchisees to pursue a Small Business Administration or Private Lender loan. What franchise business development efforts does 911 Restoration make? 911 Restoration is currently working with several national Insurers, property and facility management companies to become their preferred vendor. What is 911 Restoration’s lead generation strategy for franchise owners? 911 Restoration was a pioneer in online marketing in the restoration industry. Our in-house Google Pay-Per-Click (PPC) management and Search Engine Optimization (SEO) staff manage your marketing campaigns. What restoration equipment is needed prior to opening a disaster restoration franchise? At minimum 4 large dehumidifiers, 2 air filtration devices, 20 air movers, extraction equipment and various power tools. A more detailed equipment list will be provided to you during the franchising process. What restoration personnel is needed to successfully open a disaster restoration franchise? While a part-time office manager and at least one, full-time Project Manager is recommended to begin with, some new locations have begun with only an owner/operator. Which licenses and certifications are needed to own and operate a disaster restoration franchise? Which restoration services does a 911 Restoration franchise location offer? A 911 Restoration franchise location offers the following restoration services: water damage restoration, mold remediation, flood damage, fire damage, and disaster restoration. Why is 911 Restoration the best restoration franchise among competitors? 911 Restoration has a proven track record of growing small owner/operator restoration businesses into multi-unit operations by providing consistent lead sources and strong management support. Why is the restoration industry the best industry for franchise owners to invest in? The restoration industry is the best franchise industry for prospective franchisees because it is considered recession-proof and growing annually, making it the best franchise opportunity available in the U.S.